Christmas at the country house of Daintrey is being celebrated quietly this year because of the recent death of Sir Robert and Lady Beresford's eldest son. Only close friends and relatives are present, including 27-year-old Edmond Coventry, Sir Robert's ward. 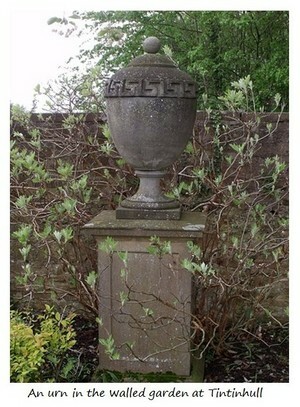 A small walled garden with a large urn in the center connects the lime walk to the house; and it is in the garden that Edmond encounters a beautiful girl in white who moves his heart as no one ever has. With each encounter he becomes more involved, despite many strange things about her: no one else has seen her; he finds himself unable to touch her; and she speaks in mysterious terms. Edmond becomes more and more frantic to win her despite all the warning signs, until a crisis point is reached. This ghostly tale is one of Margaret Oliphant's Stories of the Seen and Unseen (see link below). This story is rarely reprinted but can be found in A Beleaguered City and Other Tales of the Seen and Unseen (2000) by Margaret Oliphant, edited by Jenni Calder.